I’ve been thinking about my interviewing skills (or lack thereof) lately. I’ve done 11 interviews for my PhD now, and I’ve got another 8-9 to go – most of them coming up in the next two months (after which I am done with my data generating phase, yay!). I’ve been transcribing the interviews as I’ve been going along, more or less, which has been useful both in terms of avoiding an overwhelming mountain of transcriptions to do later, but also for reflecting on how each interview went before doing the next one. 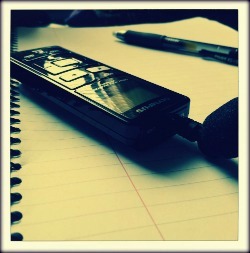 Listening to the recordings, I find myself cringing at my interviewing skills quite regularly. Awkward phrasings, leading questions, missed opportunities to ask follow-up questions… I was talking to my friend about this last night – about feeling a need to read more about interviewing techniques and skills. But even as I was saying it, I remembered that I have read a lot already, and maybe my reflex to head back to the library, is just that: a reflex, a safety-blanket, a desire to hide behind other people’s theories rather than trust in my own developing knowledge as a researcher. My interview methodology emerged through an engagement with feminist and anti-racist theory on the research process, addressing issues of power and privilege, the myth of the objective interviewer, and the dynamic relationship between interviewer and interviewee. Yasmin Gunaratnam’s Researching ‘Race’ and Ethnicity: Methods, Knowledge and Power, in particular, has left an impression on me, calling for historical accountability within the research encounter. Gunaratnam highlights the importance of recognising that both the researcher and the researched are socially situated, in relation to each other and to history. The research must always be accountable to these relationships (without over-determining them). In the research interview, my position as a white feminist researcher (researching feminism and ‘race’) is of course never neutral, but located within a history of complex and unequal relationships between white feminists and feminists of colour, as well as in a wider social and historical context of structural racism. This always forms the backdrop to my interview encounters, whether the interviewee is white or a person of colour. Part of my awkwardness at times in the interview encounters, I have no doubt, is related to my worry of not being sufficiently accountable to the historical and social context of (white feminists’) racism – of getting it wrong, and ending up being complicit within racist relations. Add to that being a novice interviewer, and as I listen to the transcripts, it’s clear that there are times where I have got things wrong (one example: a desire to alleviate tension and a white interviewee’s anxiety talking about racism, I have moved on to the next question, where, listening back, I wish I had allowed space for the anxiety to be acknowledged and interrogated, to challenge the way whiteness prioritises comfort). One, which Rubin and Rubin call ‘negotiating a research role’ (pp. 114-117 in 1st ed), is about situating yourself and your research clearly to the interviewee. Rubin and Rubin write (in a slightly patronising tone) about the importance of clarifying the research your doing in a way which is understandable / meaningful to the interviewee. For me, I think I need to give more space before the interview to discuss with the participant what my research is about, and – particularly – why I’m doing it, and how I understand myself as a white feminist researcher doing this work. I think this might help set up the context for the discussion a bit better than I have done so far, where I’ve often just asked if the participant has any questions about the research, based on what they’ve read from the information sheet, before starting (so the discussion we’ve had have depended on the participant’s questions). Another thing which I’ve been slack with is taking notes directly after the interview. Having recently read Gail Lewis’ chapter, ‘Animating hatreds: research encounters, organisational secrets, emotional truths’, in Secrecy and Silence in the Research Process: Feminist Reflections, in which she shares her research diary entry following an encounter with a racist interviewee, I’ve realised the importance of this part of the interview process in terms of capturing (partly) unprocessed feelings and thoughts. These may be fleeting and therefore not possible to recall at a later stage, but (as Lewis shows) they may have effects in terms of how we subsequently choose to interpret and present the data. Writing down these first thoughts following each interview leads to a more honest acknowledgement of the affective and embodied dimensions of the interview encounter. This is useful for reflecting more and better on your interview practice. In particular, it may help capture how underlying feelings and anxieties may be operative in the research encounter. Well, this ended up a rather long and winding post, but actually it’s helped me clarify some things already. So I guess that is the key, as I enter this last stretch of interviews: keep thinking and reflecting and writing, and review what I’ve learnt ahead of each interview. Maybe that is the key to becoming a better interviewer.